This nifty portable game console was the first (and last) to incorporate its own vector graphics monitor. An impressive piece of hardware for its time (or any time, for that matter), the Vectrex had the misfortune of being released just prior to the video game crash of 1983, so it was never produced in large quantities. The system features smooth 3D graphics and a modest but respectable library of games, making it highly sought-after by collectors. Console design: A-. The Vectrex console is solidly built, with a small black and white monitor and four-button controller that can latch onto the main unit (with some difficulty). Completely self-contained and easy to transport, the system packs a lot in a small package. A small cartridge slot is located on the side, and recessed on the front is a volume knob and reset button. A second controller port allows a second player join the action, but it's awkward for two heterosexual males to crowd around the small, enclosed screen. Console durability: A. Despite housing its own monitor, the Vectrex is a durable system that ages well and is not known to break under normal use. Due to its substantial weight however, the consequences of dropping the unit on a hard surface could be severe. Controllers: A-. 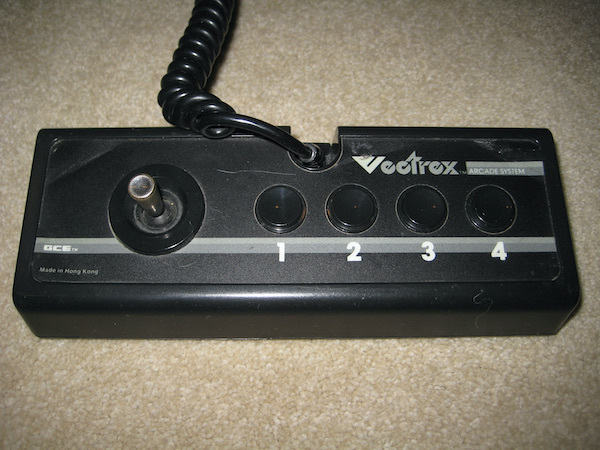 The standard Vectrex controller is rectangular and wide, with a small metal joystick and four buttons in a row. The joystick is analog and the buttons are small but easy to tap. If you're looking for a second (or replacement) controller, good luck! it's extremely difficult to find a standard Vectrex controller in the wild. Thankfully however, there are on-line stores that provide Vectrex controllers converted from those for other systems. Media: B. Shaped like small blocks, Vectrex cartridges are compact but don't offer much real estate for artwork. Some of the newer Vectrex releases (Gravitrex) are made from recycled Intellivision cartridges, which are much thinner but have an identical pin configuration. Packaging: C. Vectrex games were sold in boxes about the size of the Atari 2600 boxes. Not particularly eye-catching, these boxes were all printed in the same gray pattern, and the artwork on the front on the box was small and unimpressive. Games: B-. 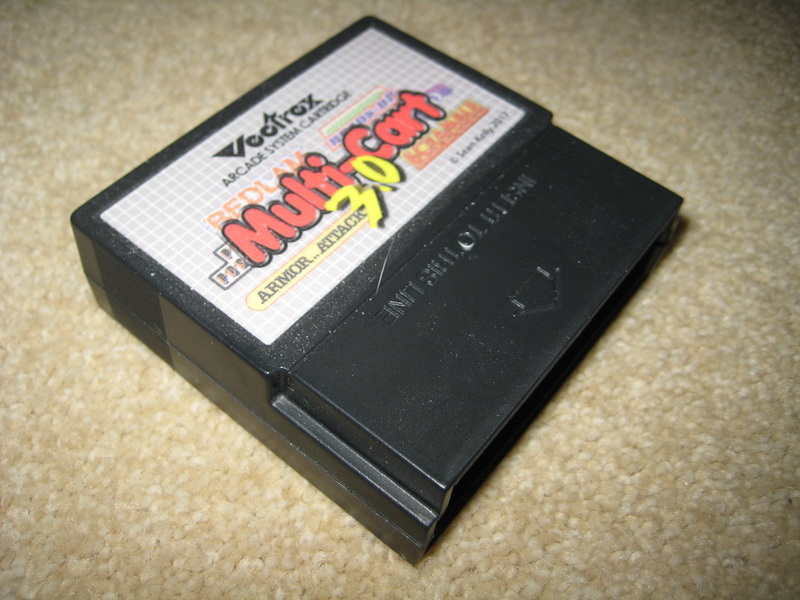 Most Vectrex cartridges were developed by a company called GCE. Most of its games have passed the test of time and still raise eyebrows today. Although GCE licensed a few arcade hits like Berzerk, Star Castle, and Pole Position, most of its games were clones of old favorites. The best example of this is the Minestorm, a phenomenal Asteroids clone that's built right into the system. 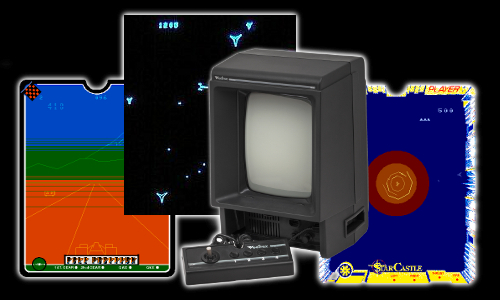 Although the Vectrex was not well suited to sports or maze games, it did excel at shooters like Star Castle, Scramble, and Fortress of Narzod. Graphics: A-. It's difficult to compare Vectrex graphics to those of other consoles, with its crisp lines and smooth, scaling objects. If you've ever played the original Asteroids or Tempest, you know how appealing vector graphics can be. They stand in stark contrast to the choppy, pixilated sprites on other systems of the early 1980's. One drawback to vector graphics is that they tend to flicker when enough objects are on the screen, but this is not noticeable in most Vectrex games. The system's primary drawback, the lack of color, was half-heartedly addressed by colored overlays included with most games that fit over the screen. These didn't add much to the experience and are difficult to locate today. Audio: C+. You wouldn't think its little speaker was capable of much, but the Vectrex can deliver some surprisingly decent music and crisp explosions. Some of the more recently developed titles even feature some modest voice synthesis. Unfortunately, the speaker does tend to have some slight static or buzzing depending on what's happening on the screen. Collectability: D. For collectors, the Vectrex is an expensive proposition. Obtaining a good system can run over $200, and the cartridges are neither cheap nor easy to find. The convenient multi-cart is really the way to go if you can locate one. I personally have never pursued the color overlays, mainly because I think the games look great without them. 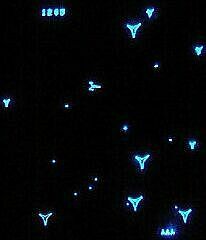 If you can afford it however, the Vectrex is an impressive addition to any video game collection. Innovations: Self contained monitor, vector graphics. + Amazing vector graphics featuring scaling and smooth animation. - System and games expensive and rare. - Limited library and few arcade titles.